After starting my Wednesday at SXSW 2018 with a keynote speech by Lyor Cohen at the Austin Convention Center, I decided it was time for both some fresh air and some music. With that in mind, I headed to the Aloft Austin Downtown hotel, which played host to a full showcase of female artists, sponsored by Aloft Hotels and Universal Music Group. The lineup included several artists on my “must see” list, and the breezy but intimate patio lounge proved an ideal venue for both listening and taking photos. Nashville alt-rock singer/songwriter Liza Anne came to Austin hot on the heels of her latest LP release ‘Fine But Dying’, which came out on the 9th of March via Arts & Crafts. As you might glean from the title, the songs on ‘Fine But Dying’ aren’t exactly upbeat, their lyrics dealing with such heavy topics as love, patriarchy, and mental illness. But in live performance Liza Anne didn’t shy away from even their most angst-ridden moments, addressing them with dark humour and unflinching candor. She gave a fiercely memorable performance of several of the new tracks on the Aloft stage, including ‘Closest to Me’ and ‘Small Talks’. Richmond, VA native and Spacebomb Music associate Natalie Prass came on next to play songs from her upcoming sophomore album ‘The Future and the Past’, due out on the first of June via ATO. I’d seen her live previously, both at SXSW 2015 and in Tucson later that same year. In the three-year interim, Prass has written not one but two album’s worth of songs, one of which she scrapped in favour of what would become ‘The Future and the Past’. 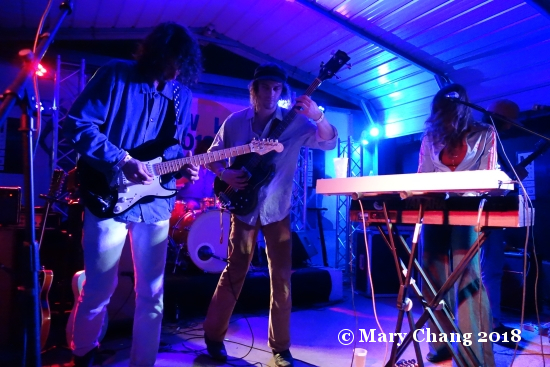 Prass gave a charmingly relaxed set here, with the new songs sounding remarkably jazzy and fresh in the cool breeze on the Aloft stage. We’ve already featured the new album’s first single ‘Short Court Style’; you can have a listen to the recently released and singularly appropriate track ‘Sisters’ just below. New Orleans soul/spoken word group Tank and the Bangas are led by singer and poet Tarriona Ball, whose deliberately unassuming stage presence masks a sharp lyrical precision and an almost hypnotic vocal style. Backed by fellow vocalist Anjelika Joseph and a full band of instrumentalists, Ball had her audience enraptured from the first moments of the set to the very last. I’m not sure the visceral power of this kind of music can ever really be captured on recording, but if you have the chance to see Tank and the Bangas live, don’t miss it. My favourite track in their set was ‘Rollercoasters’, which you can hear in this live video from American public radio station WXPN’s World Cafe. The remainder of the Aloft Live lineup included British singers Jade Bird and Bishop Briggs, both of whom I was (fine but) dying to see, but I took a rain check for the moment, knowing I’d have chances to catch them later in the week. At the moment, I had a long walk ahead of me, across to the east side of downtown, for the Single Lock Records showcase and Nashville folk rock songwriter Erin Rae. While the stage at Weather Up, which played host to Single Lock that day, was decidedly less glamourous than the one at Aloft, the songwriting on display was nonetheless strong. Rae appeared with a sparse band of two members, whom she admitted to having “borrowed” for the afternoon from fellow Nashville singer Tristen, to play songs from her upcoming album ‘Putting on Airs’. Rae’s wistful singing voice on the title track from that record, and especially on recent single ‘Can’t Cut Loose’, made a poignant and lasting impression as the afternoon sun began to fade into evening. My SXSW 2018 Wednesday afternoon technically began late in the morning at the Austin Convention Center, with an 11 AM keynote speech by YouTube Global Head of Music Lyor Cohen. I was a bit tardy in arriving to the Convention Center to queue for the popular talk, and I ended up sitting in the overflow room, where the speech was being simulcast on a big screen TV. This arrangement in no way detracted from Cohen’s message or the enthusiasm of the attendees, who nodded and occasionally even applauded as if Cohen himself were actually at the front of the room. In the context of his career highlights, Cohen made note of some of the biggest changes he’s seen in the industry, emphasising his own willingness to accept new ideas and his ability to adapt to an ever-changing landscape as the keys to his success. From that point, he moved on to discuss his current position at YouTube, including plans for some major changes that are already in the works. Cohen described his vision for music on YouTube in terms of three basic goals: (1) creating diversity of distribution through ads and subscriptions, (2) collaborating with label partners to promote and break artists and (3) giving artists, labels and managers the best direct consumer access across any other platform. While I’m not entirely convinced about the wisdom of Cohen’s first two ideas, his third, regarding direct consumer access via YouTube, was at least partially on point. “The most powerful aspect of YouTube is our ability to allow artists, managers, publishers, songwriters and labels to engage with their fans with no hoops to jump through,” he said. “Whether it’s promoting a new video, an album, a tour or a live stream, the only place the music industry can play in both commerce and direct to consumer is YouTube.” Let’s hope Cohen keeps it that way. If you’re interested in hearing Cohen’s hour-long keynote speech in its entirety, SXSW has made the full video available online. You can watch and listen just below. For the first time all week, I didn’t have a plan at the start to my evening. I had some tentative ideas but then decided I should probably queue for Latitude 30, as I had been locked out of the press allocation of the SXxpress passes for Saturday night. Both Carrie and I have seen daunting queues outside the venue in past years but this year, the British Music Embassy didn’t seem as big of a draw. Friday night’s rap-focussed night headlined by SXSW 2016 showcasing artist AJ Tracey had trouble getting foot traffic in, they ended up opening it up to the public. 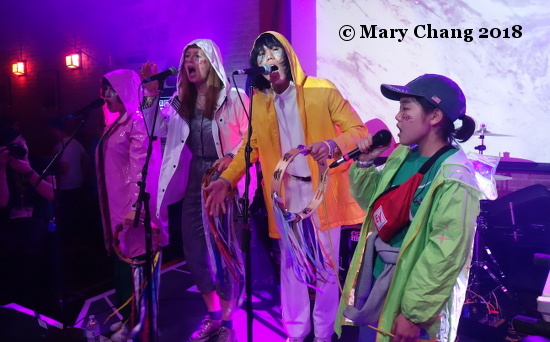 I was surprised that I was able to get in and in plenty of time ahead of the start of Superorganism’s set. There’s been huge buzz around these supposed ‘aliens’ and so they were more of a curiosity to me than anything else. This evening was sponsored by BBC Radio 1 and the UK’s Department of International Trade (formerly UK Trade and Investment). In reality, the band hail from varied locations as New Zealand, South Korea, and Lancashire, while being led by the teenaged American via Japan Orono Noguchi. As a friend of mine with me that night quipped, “they’re like a mad version of The Go! Team!” Hard to argue with that logic. Their schtick is to act like they’re not from this planet, from the funny raincoats they start their set with, to pretending they don’t know what Teddy Grahams are. I didn’t find them as funny and avant-garde as advertised. I have trouble stomaching young kids swearing and witnessing Noguchi do this as part of her stage patter just came across as uncomfortable. I can see the pop appeal of their weird songs: they’re easy to sing along to, and who doesn’t think dancing shrimp are cute? But is this a project that has legs? Clearly, Domino Records think so, they put out their debut album last year. They’re appearing at the Great Escape in May, and I’m just happy I can say I’ve already seen them and leave that show in Brighton to their crazy fans. 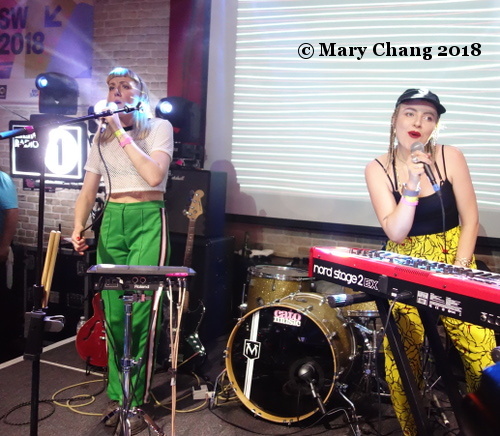 I hung in there so I could watch girl duo IDER, recent signees to Glassnote Records. 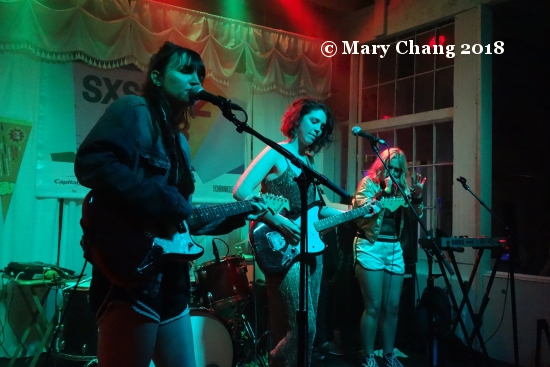 IDER were invited to showcase at SXSW last year; we previewed them then and I was so disappointed they didn’t come out to Austin. A year of tightening their sound and live performance led to this week in Austin where they performed at show after show and did so with smiles on their faces. Their last chance to impress was at this BBC Radio 1 and Department of International Trade showcase at the British Music Embassy. Megan Markwick and Lily Somerville certainly didn’t look like they’d been put through the SXSW wringer. Beginning their set with an arresting a capella duet, it seemed they were eager to prove that their voices could stand on their own and without electronic augmentation. Like their many shows in Austin before it, this one was full up and proof that word had gotten around about their talent. There’s nowhere for them to go but up from here. Uncomfortable by the sardine situation at Latitude 30, I said goodbye to my friend, extricated myself from the crowd and walked on to my next destination on 6th Street, fully expecting to be to have arrived during a changeover. 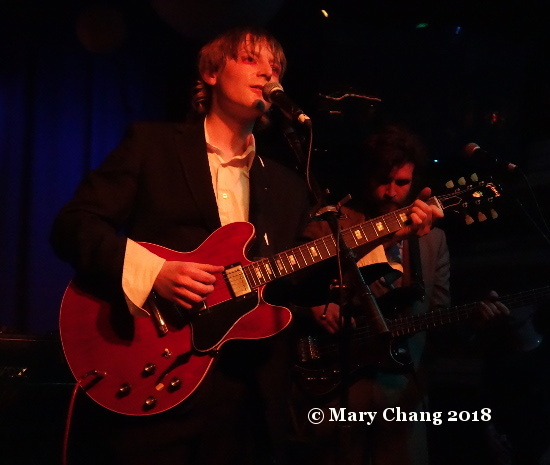 Returning to the Velveeta Room for a second timethat week, I was pleasantly surprised to be able to catch the latter half of Margate singer/songwriter Dan Lyons’ set. As regular readers of TGTF know, the singer/songwriter genre is Carrie’s forte, not mine. I find that after a while, these artists start to blur in sound and in my mind. Don’t sing to me from atop a stool. Others may think you’re cool, but I’ll just be bored. I’d rather rock out. There is a dark edge to Lyons’ songwriting, a world of blown smoke rings, psych and blues and Laurel Canyon harmonies with his bandmate and partner Freya. The songs are Something tells me he’d get along with Stephen Duffy and they’d have a laugh, like I had described New Pope at Hard Working Class Heroes 2016 should go drinking with Dylan and Tom Waits. Lyons was previously the drummer for Fat White Family in a previous life, so it’s nice to see an artist coming from behind the skins to do his own thing. The label ‘synthpop’ LYLO have been given hasn’t done them any favours. I know what I think synthpop sounds like, and there are legends of the genre like my beloved Duran Duran and OMD that tend to used as examples. The Glaswegian band go far beyond the basic synthpop mould by having a saxophone player – seriously, what synthpop band do YOU know has a saxophonist? – and their cool attitude oozing from every pore. You remember Gerry Rafferty’s ‘Baker Street’, right? Recall that Rafferty was Scottish and this hipness is buried there in their DNA. On ‘Turn My Jacket’, there’s a lot going on, but it’s a happy kind of organised chaos. I found my head bopping to the beat and cheering on these lads. I cracked up as I watched the legs of their keyboardist move around as if they had a mind of their own. Mind you, this was all happening while his hands were at attention on the keys. I guess even he can’t control himself when he gets swept up in the rhythm? What better way to finish out my SXSW 2018 than with a band that I’d discovered while listening through all the bands from the Continent, poised to find the next big band out of Europe. 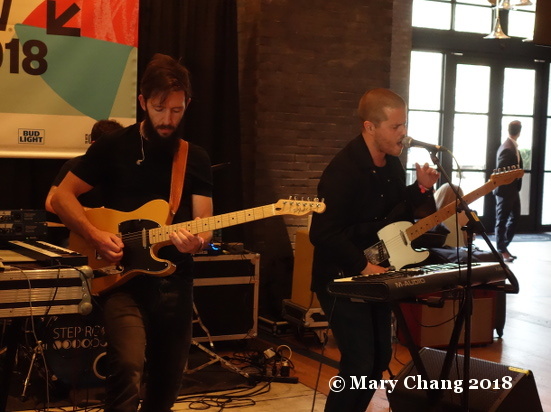 Moonlight Breakfast, who I’d previewed in the Music Bloggers Guide to SXSW 2018, were appearing at Friends. They were prepared: they had brought their own lighting and projection screens on which they could run their own visuals. These may not sound like much and possibly unnecessary at a dive like Friends. But taken together, they made their show stand out as a professional presentation from nearly all the others I’d seen all week. World class. I would like to think that the place was packed because people had heard about them through my write-up and word has spread fast. Make no mistake, ‘professional’ doesn’t mean stuffy. Like LYLO before them, they had a secret weapon in the form of the clarinet that their drummer ‘Bazooka’ played on ‘I Feel Like Dancing’, and to huge audience cheers. The bounce of singles ‘Time’ and ‘Shout’ made them irrepressible and so catchy, you could feel the energy building in the room. Singer Christie sang with a megaphone and with a huge grin on her face. She knew they’d done good. On the final night of SXSW, you couldn’t ask for a better high note. Fans were fighting over who would buy them drinks after their performance. I smiled to myself as I skipped out the front door of the bar. My job here is done. I went back to the hotel to start packing for the trip back home and to mentally prepare for the difficult return to my normal life. Seeing Moonlight Breakfast wow a crowd like that was another reminder, like many reminders that week, that TGTF and my writing and opinion here makes a difference. I know for myself that although I can’t be that singer I wanted to be when I was a little girl, the next best thing I can do is to help that girl (or guy) with the same dream. Dream big, laugh, love. Goodnight, SXSW 2018. 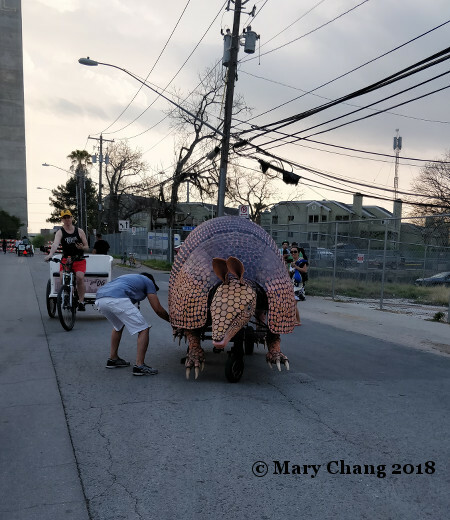 For more of my photos from Saturday at SXSW 2018, visit my Flickr. I’m always amazed how I feel when I reach the Saturday of the SXSW Music Festival. Everyone who is going at it as hard as we do is exhausted. But we’re also sad. Months of preparation have culminated in our coming out to Austin for this event highlight of the festival calendar, and a part of you dies inside as you accept that it’s almost over. The Irish rugby-crazy throngs were already up and at ‘em at B.D. Riley’s, so we slept in and decided to get brunch instead. The fancy schmancy Stella San Jac in the Westin was just down the road from the Omni where we stayed this time. At first, I was surprised to see that the place wasn’t crowded. But then I considered that maybe everyone else was still in bed at 1 PM, in the fetal position and nursing hangovers. 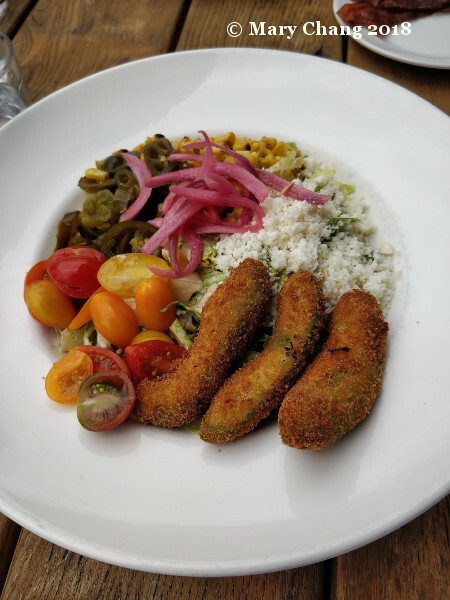 I hadn’t eaten in nearly 24 hours, and Carrie noted I was hoovering a fried avocado and roasted corn salad in front of her. Ha. After Carrie had a few cups of needed coffee and I downed a bacon bloody Mary, we went down to the convention center for one last time. Carrie headed to a session, while I went into the Trade Expo for some music at the Flatstock stage. Unintentionally but altogether happily, I got a bit of a second helping (side dish?) of Montreal’s Bodywash. I said hello to the band afterwards and we had a nice chat about Pop Montreal vs. M is for Montreal. Pro tip: if you ever need information about an event, ask the people who live in the town where it’s taking place for advice. I came away wanting to visit Montreal ASAP. The coolest thing for artists about the stages at the convention center – Flatstock, International Day and Radio Day – is that the people who attend these are probably going to be different than those who show up to your afternoon appearances and your evening showcases. It offers another opportunity to wow a different crowd. 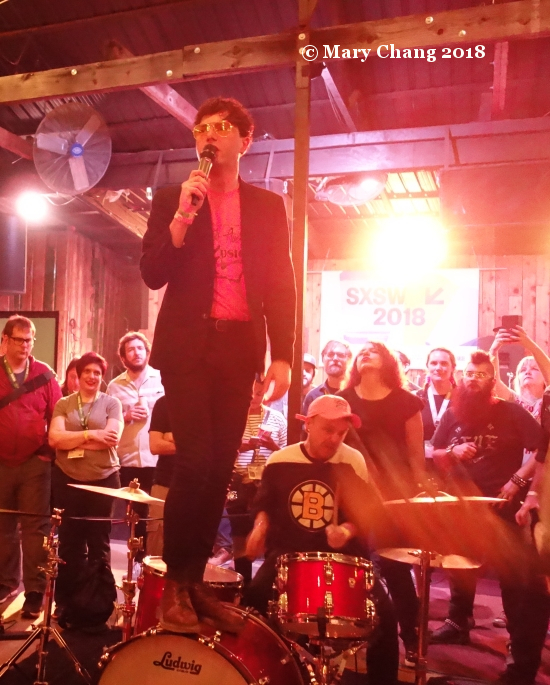 As the SXSW Gaming Expo was in full swing Saturday, some gaming-inclined kids had wandered into the Flatstock stage area and were spellbound by the next act, Ascot’s Febueder, who I previewed ahead of SXSW back in February. I want to describe their music is soulful, jazzy and catchy – it is all these things – but that would be simplifying it too much. If alt-J hadn’t happened, I don’t think an act like Febueder could dream big. Post ‘An Awesome Wave’, the possibilities are now much wider. I think I always worry how an act is going to be received in the bright lights of the convention center, especially on a Saturday afternoon. But in Febueder’s case, the concern wasn’t needed at all. 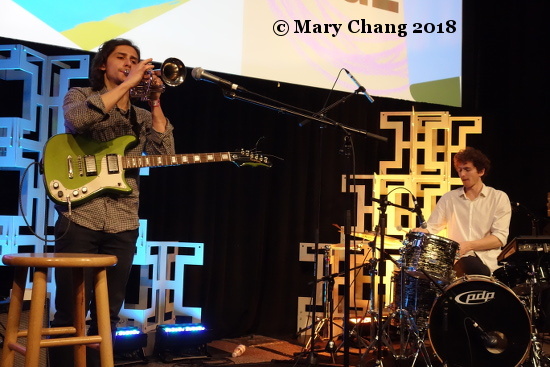 Their trumpet and electronic drum-infused music was out there at times, yes, but it hit the spot for those keen on finding a new band to follow. Afterwards, people came up to the stage excitedly, wanting a handshake and to know how to spell the band’s name so they could find their act on Spotify. Mission accomplished, guys! Following two drink interludes – hey, it was St. Patrick’s Day, I’m not turning down a green-coloured ginger beer – Carrie and I split up to catch two acts at Second Play Stages. In case you aren’t familiar with these, they are shows that are mostly before the 7 PM hour at hotels and other unconventional venues that are free and open to the public. Carrie used the opportunity to pick up a performance by Harry Pane at the Hilton that I happened to see on the Second Play schedule. 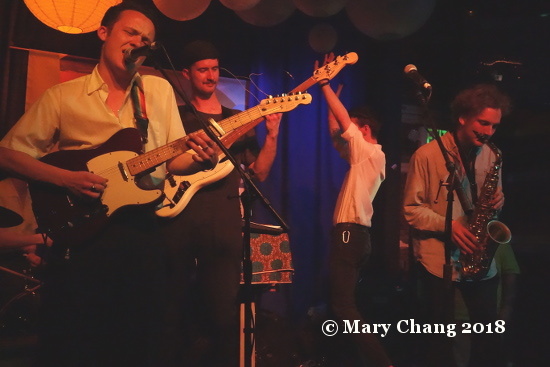 I headed down to Davis Street to check out the Hotel Van Zandt for the first time and to see a band for a second time that week. I seriously wonder what kind of parents think it’s a good idea to bring their families with young kids out to Austin during SXSW. Well, at least if they’re hanging around a hotel lobby in the afternoon, they’ll see some good music, right? Some of these kids sat in front of the stage were lucky, as STAL were ready to roll for their last performance in Austin. Weirdly, the stage was next to the front door with a steady stream of new hotel guests coming through, so for onlookers, it was distracting to say the least. 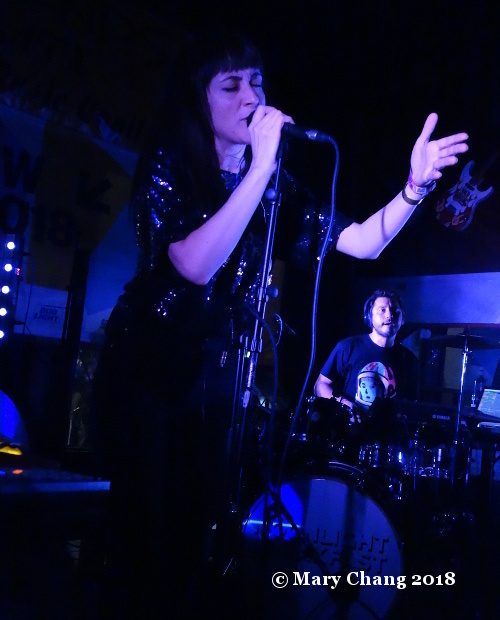 Taking that into account, STAL admirably ignored the weird situation they found themselves in and performed their style of synthpop as if they were in any other venue in Austin. They sounded great, even if the people watching them weren’t dancing as I had hoped they would. Maybe the adults were as tuckered out as I was? For more of my photos from Saturday at SXSW 2018, visit my Flickr. Following an interview at the Omni that went swimmingly well, I skipped in dinner in favour of starting my evening strong at Canada House at Swan Dive. The venue’s two stages were taken over by Montreal’s two biggest music events on their calendar, POP Montreal and M is for Montreal. Though I arrived too late to see buzzed about Montreal rock band Corridor on the outdoor M is for Montreal stage, I did get a drink token and could settle in to watch fellow Montrealians Bodywash, friends who met at McGill University. They play a hybrid between shoegaze and synthpop, with dreamy vocals and a rich wall of guitars. Quite lovely. I popped outside to catch a few songs from another synth-driven act from Montreal, Anemone (real name Chloe Soldevila) and her backing band. She’s the second signee to Luminelle Records, a new venture between the Gorilla vs. Bear blog and Fat Possum Records. Luminelle will be releasing her EP ‘Baby Only You & I’, featuring the sweetly seductive echoes of the title track. Back on the indoor stage at Swan Dive were Motel Raphael, three ladies who GQ UK anointed some years back as “the most exciting band to come out of Montreal since Arcade Fire.” A heady compliment indeed, and one entirely deserved. While successful, all-female harmonising groups are nothing new – consider Wilson Phillips, the Dixie Chicks and more recently, The Staves – I really don’t think there are enough of them in the public eye, and Motel Raphael are the kind of band young girls interested in becoming musicians need as role models. I was impressed with their vocal range on their songs that sat more on the folky singer/songwriter side of the spectrum, as well as those in a more straightforward, bright pop vein. Friday was also an opportunity to see some friends in action. On that note, I was headed to what I knew would be a crowded showcase, Communion’s annual tradition of taking over St. David’s main room. 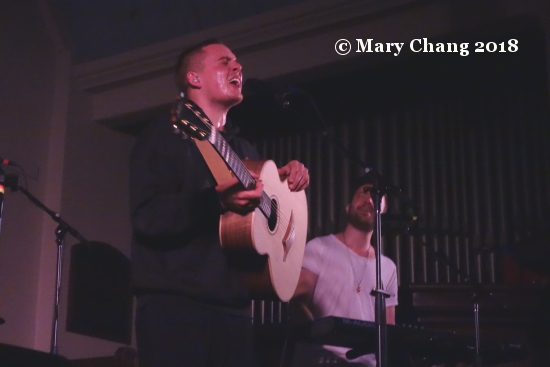 Second on the Communion Presents lineup for the evening was rising Irish singer/songwriter Dermot Kennedy, with TGTF friend Micheal Quinn of Meltybrains? on drums. Along with SXSW, Kennedy was in the States for a series of shows, many of which sold out even before he set foot on American soil. Melding the popular genre of hip-hop like that of Drake with the evocative singer/songwriters like Glen Hansard who has become a friend, he offers an olive branch to fans of both types of music with his heart-on-his-sleeve type, accessible writing. As fans thunderously applauded him in the church following his last song of the night, I was reminded that watching a star in the making is a priceless moment. I had every intention of staying for part of Sam Fender’s set that followed Kennedy’s, but the stage was running so behind schedule, I decided I better make a move to my next destination. I had never witnessed a Fluffer Pit party, but it was high time that I did. They had taken over both stages of Barracuda and I hadn’t been aware that there were two entrances to the place. I was so used to passing from one stage to the other through the internal door separating them. It seemed to take forever but I finally gained admittance through the alley door to the Barracuda backyard in the midst of The Wedding Present’s set. Instead of having the artists perform on the stage, the ‘stage’ had moved to the gravelly ground, with the audience watching the talent in the round around them. Ironically or not, I had heard them playing ‘Kennedy’ (“too much apple pie”) and bopped my head to it when I was still in the queue outside. I entered just as they were just able to break into my favourite Wedding Present track ‘Brassneck’. What a difference from the Seven Grand show the previous night, under weird blue lighting and the pretension of a whisky bar. This was a much more appropriate venue for them. The same could be said about TGTF friends LIFE, who appeared next on the Fluffer Pit bill. Hull’s finest were ready to enthrall the crowd with their politically charged numbers with plenty of welly. They appeared in Austin for the first time last year for SXSW 2017, and now they were back with debut album ‘Popular Music’. It was great to let loose with th’ lads as Mez Sanders-Green led the band through riotous tune after tune. You really haven’t lived if you haven’t shout-sang along to ‘Ba Ba Ba’ or ‘Rare Boots’ and headbanged until you couldn’t headbang any more. So that I would still be able to nod in the morning, I said goodbye to dear friends and re-emerged into the Austin night for something slightly more chill. I next had to choose between Polish psych and Seattle synthpop. After the sweat and workout at the Fluffer Pit party with LIFE, I decided I could do with a nice, soft cushioned seat and a drink. To avoid the mayhem ensuing on 6th Street, I chose Sisters at Maggie Mae’s Gibson Room. Formerly the Wednesday night home of Music From Ireland, it was nice to revisit a place I’d come to regularly. Friday night, it played host to the Public Access Touring and Superior Music Publishing showcase. Andrew Vait and Emily Westman are a synthpop duo with a difference. Given their academic backgrounds, that’s not surprising: they both were schooled at University of Miami’s Frost School of Music, which probably explains Vait’s onstage flute-playing and his squeals of guitar, sometimes in the same song. While they weren’t playing to a big room of people, Sisters didn’t let that bother them, putting on an energetic set punctuated by Westman’s big, booming drumbeats and her and Vait’s combined vocals.